Jorge Luis Borges and Margarita Guerrero together wrote a series of essays on various deities and monsters in literature. These were compiled and published in book form under titles such as Manual de zoología fantástica and El libro de los seres imaginarios. Two different English translations were produced respectively by Norman Thomas di Giovanni and by Andrew Hurley. It it clear that for much of the material in the original Spanish [book] — sometimes entire “entries” — Borges was translating directly from a source, acknowledged in some cases, unacknowledged in many others, or was using a Spanish translation of a “classic.” Quite often, he seems to have been translating (or rewriting) into Spanish from an English translation from, for example, the Greek…. The nature of Borges’ erudition, creativity, and sense of fun is such that it has been simply impossible to ferret out all the originals, where originals in fact ever existed (some of his “quotations” are almost certainly apocrypha, put-ons)…. [My own translator notes] may make the book [in English language] seem stodgier, more academic, less fun that it was clearly always meant to be. I hope that readers of this volume [translated by me], dipping into it here and there as Borges hoped they would, will not lose (or be stripped of) their sense of playfulness by feeling that they have to go look up the page numbers for Pliny [for example] — think of it as just another of Borges’ ways of blurring lines between the serious and the playful. I have dipped into just one entry for this particular blogpost. 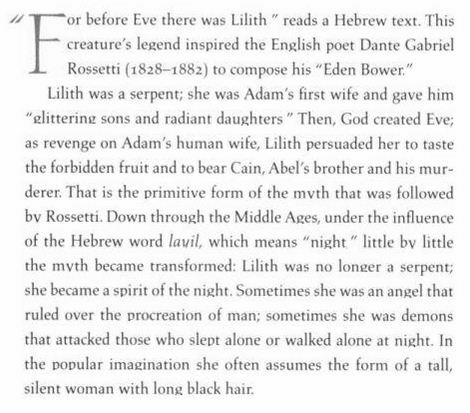 Below is the essay entitled “Lilith” in the Spanish and in the two respective English translations. 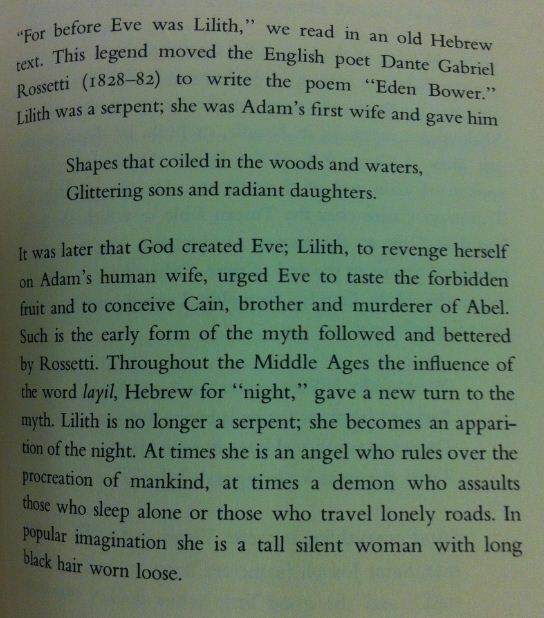 For more on Lilith, blog readers may want to consider this BLT Blogpost written by Ann Nyland. In addition, here is the entry in the online work, Jewish Women: A Comprehensive Historical Encyclopedia, written by Rebecca Lesses.